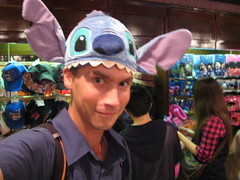 My last week in Japan found me winding down. After 5 months of traveling I’m exhausted. We took an all-day bus from Kyoto to Tokyo, considerably cheaper than the bullet train and thus much slower. 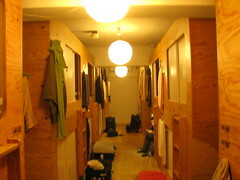 The hostel we’d booked wasn’t hard to find and for the price I think it was a reasonable deal. Khaosan Ninja it’s called and it was modeled after the famous capsule hotels of this city. We’d hoped to stay in one of those but they are mostly just for men. The ones that do let in ladies, only let in ladies and what’s the point of being in Tokyo with your girlfriend if you have to stay in different buildings? Khaosan’s bunks were each walled in with chipboard and had sliding panels to make each one into a box. 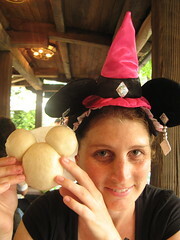 I’ve been to both Disney World in Florida and Euro Disney near Paris, but that was over 10 years ago so we thought it was high-time I had a top-up. Tokyo Disney is apparently modeled on the one in California, which I’ve never been to, but I think it fits well into the chain. Maybe it’s that I am 10 years older now but the lack of proper roller-coasters was a bit of a let down. Space Mountain was fantastic. So good I rode it twice. Thunder Mountain, the run-away mine train, was ok for all its tight twists and winds. 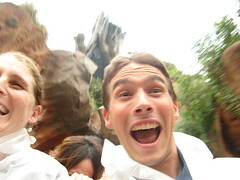 Splash Mountain, the log-flume, was a good laugh too. The other rides were either kids’ float-along ones like Pirates of the Carribean, or motion simulators like Star Tours, neither of which appealed to me. 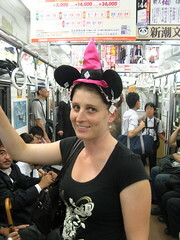 I think Tania felt the same for most of these, but she did get into the spirit a bit more than I did by wearing her Princess Minnie hat all day, even back home on the subway :-) It’s interesting what people can be persuaded to do if everyone else is already doing it. I saw many otherwise normal teenagers wearing Tigger tails or other cartoon regalia. Neither Tania nor I are big drinkers. There are plenty of people who come to Tokyo just to party, and it’s a good city to do that, but we prefer a more laid back approach most of the time. 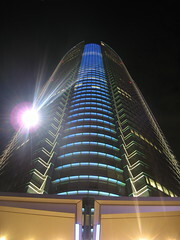 Roppongi is one of the night-life centers of Tokyo and towering over the district is Roppongi Hills. Built to be a city within a city it has almost everything you need in one go, if you’re super rich and just need bars, expensive shops and a skyscraper. It sort of reminded me of one of the buildings you get at the later stages of SimCity 2000. There were fancy apartment blocks, an indoor up-scale mall and a strange spidery sculpture that followed Nivi around the world last year. With that covered I had just two more things to see in Japan. Not that I’ve seen everything here, but there is a limit to what one person can absorb. 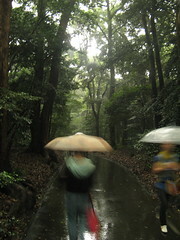 The Meiji Shrine is reputedly the best in Tokyo, so despite torrential rain and darkening skies I trekked over to see it. For a mega-city like this I was amazed how quickly the footpaths were swallowed into the forests. The canopy above, and admittedly the heavy rain clouds, hid all signs of the metropolis outside and I was suitably impressed by the low-rise buildings in the middle. 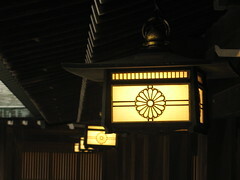 The shrine was built to honour Emperor Meiji. Under his rule Japan ended its self-imposed isolation from the world, but was destroyed during WWII. Not exactly a good omen for dealing with other countries. Anyway, they rebuilt, true to the original design and imported massive cyprus trees from Korea rather than doing a slash-dab fero-concrete replica like some of the ‘restored’ castles. 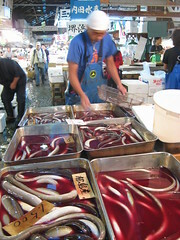 On the morning we left I mad an early diversion to the Tsujiki Fish Market. It’s where the daily catch comes in and gets auctioned off to restaurants. Apparently it’s a frenzy of flying fish when it kicks off at 5am, but the subways aren’t open then so I missed that part. What I saw was the stalls chopping up their seafood and scooting them around on specially-made carts that featured a strange vertically mounted engine that swiveled a full 360 degrees and was accelerated by a circular handle on top. It’s almost like a fairground bumper-car, if pressing the steering wheel made it move. Hundreds of these things were weaving in and out as I, and many more tourists, meandered between the piles of frozen tuna, bleeding eels and some fish that were still twitching.